Play hide and seek with all the pesky things in our pick of the best hidden object games. First: what's a hidden object game? Gaming regulars will likely be familiar with the medium’s many, many acronyms, and what they stand for, be it MOBA, FPS or tLotR:tBfME2:tRotWK. Okay, you probably didn’t know that last one, but how about HOG? That might sound unfamiliar, but it stands for one of the oldest but most overlooked genres in the industry; the hidden object game. Believe it or not, there are dozens upon dozens of these titles available to play on PC, mobile and even console, many of which come equipped with a relatively low price tag. Of course, with so many titles on offer, the quality isn’t consistent across the genre, but diverges wildly depending on a number of factors, leaving only the best of the best to make it to the top ten of our list. Read on to find out which games cut the mustard. So, you wake up one day and everyone else in the world is missing. Suddenly, the apparitions of famous historical figures, from Abraham Lincoln to Cleopatra, show up to help you investigate what the hell is going on. If that sounds amazingly bonkers, that’s because Time Gap is a hidden object game that isn’t content with being just your average hidden object game. Aside from the ridiculous story conceit, Time Gap draws from a range of other genres to freshen up its main course of hidden object gameplay; one minute you might be playing connect-four, the next it’ll be Puzzle Bobble. It’s a flawed but undeniably interesting subversion of HOG standards, and one which is worth a shot purely for its inventive approach to the form. High production value is far too rare a commodity in hidden object games these days, so when a title like Lost Lands: The Golden Curse drops onto the scene, it becomes easy to appreciate its premium standards of quality. Fully rendered 3D cut-scenes, striking visual design, a fantastic soundtrack on top of stellar voice work… these are the hallmarks of greatness for hidden object games, and Lost Lands has it all. Its particular mode of gameplay isn’t perhaps as challenging as genre diehards might be inclined to, but the variety of things to do makes up for it, widening the accessibility of Lost Lands to appeal to anyone with even a slight taste for the art of object hunting. What is it about hidden object games that warrant such strange and lengthy subtitles? Either way, The Forsaken Bride is certainly an interesting enough draw for the curiously minded, and the game doesn’t fall short of its namesake either. The world is stunning, drenched in colour and character, with compelling puzzles to boot. Oh, and you get an adorable 2.5D sidekick in the form of a magic cat, who can help you out with tips whenever one of Grim Legends’ trickier brain teasers has you stuck. What’s not to love? This sleeper hit from HOG veterans Artifux Mundi drinks from the same well as The Witcher 3 in terms of creative inspiration, using Slavic folklore as the basis for an intriguing story of half-demons, kidnapped grandmas and potential world collapse. It’s a high quality work, with compelling performances and fantastic artwork steeped in Eastern European mythology. There’s bonus challenges and meta-games beyond the hidden object gameplay too, so you don’t have to worry about getting bored of Eventide’s whopping 43 HO scenes either. An easy purchase for any hidden object game lover. For those of you who were left feeling shortchanged when Uncharted 4’s pirating backdrop didn’t feature any supernatural swashbuckling, don't worry, Nightmares from the Deep: The Cursed Heart has you covered. The game couldn’t feel more pirate-like if it tried, turning every minute spent trawling its atmosphere-rich scenes for items into a jovial delight, even when things get a little too spooky for comfort. Beyond that, there’s also a fun little Mahjong mini-game for players to tuck into, which breaks up the gameplay neatly with some harmless block shuffling. Big Fish Studios is currently the, erm, big fish of the hidden object games market, but the majority of its titles can be discounted as nothing more than hastily thrown together pieces of shovelware. There are, however, a few exceptions to this rule - the Drawn series being one of them. The second game in the trilogy, Dark Flight, is by far the best of the bunch, picking up right where the last title left off in its whimsical fable-like tale. The game fuses point-and-click adventure-style puzzles with classic hidden object gameplay to straddle a nice balance between challenge and user accessibility, all of which is presented in a suitably fairy tale-esque collection of backdrops and colours. There’s room for improvement in certain spots of the production, but for less than ten bucks, Drawn: Dark Flight is a great jumping in point for newbies to the genre. 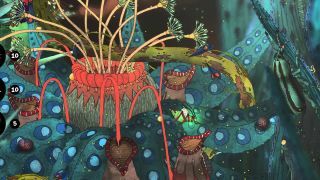 Fauna has always been a go-to barometer for developers to show off the technical horsepower or artistic breadth of their game, as any past E3 demo will prove. The grass sways in the wind! Trees catch fire in thunderstorms! The mud contains flecks of cow manure! But none can quite match the fidelity of Morphopolis’ mesmerizing microcosms of sprouts and shrubbery. Every frame of Dan Walters’ exception HOG could be a painting in a modern art gallery, making it difficult not to just fall asleep to the artistic hypnotism. Thankfully, the gameplay itself, in which a lowly aphid grub ventures for his spawning ground while continually metamorphosing along the way, is engaging enough to not be entirely overshadowed by the resplendent visuals. To make something genuinely scary out of a hidden object game is quite the accomplishment. It is a genre that tends to be nearly devoid of animation, after all. And yet, somehow, developer Goblinz has managed to craft a deeply unsettling, impressively scream-worthy experience with True Fear: Forsaken Souls - a title that delivers more frights than some of the most expensive horror games out there. The game values suspense and paranoia over any other horror cliches, using its engrossing puzzle gameplay to draw players into a world caked in the stench of death and the macabre. Before long, True Fear will have swept you into its environments, leaving you entirely vulnerable to its toybox of scares and spooks. No, this isn’t a sequel to the horrendously embarrassing (but secretly amazing) Tommy Wiseau movie, The Room. It’s the latest puzzle experience from Fireproof Games, and the most recent title in a video game series that essentially plays out like the next best thing to an actual escape room. Players must navigate the labyrinthine complex of an ancient crypt using only their wits and any nearby resources at hand, all while soaking up the devilishly moody atmosphere, laden with mystery and menace. The Room Two has more layers than a traditional hidden object game, throwing complex environmental puzzles and contextual riddles into the mix. In doing so, however, it expands the confines of the genre to devise a brain strain that is entirely its own thing, design conventions be damned. Imagine what Where’s Wally would look like if drawn by a New Yorker cartoonist, and you already have a good idea of what Hidden Folks is about. Forget your preconceived notions about monochromatic minimalism; every image of Hidden Folks is a tapestry of micro-narratives, bursting with detail and bubbling with life. Good thing too, as you’ll spent most of your time scouring every pixel to locate the most obscure objects that the game tasks you with finding. Those challenges are a joy in and of themselves, though, as Hidden Folks provides artistry that’s more than worthy of its demand for forensic study and extended appreciation. A modern hidden object game in every sense of the phrase, Hidden Folks is an absolute must buy.